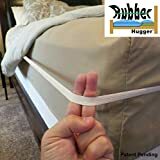 Rubber Hugger - The Sheet Tucker Band – Unique New Concept for Securing Bedding. - No More Untucked Sheets! - No Clips, Grippers, Suspenders Or Fasteners - Large Mattress Band for King Mattress. FOR PROPER SIZING: See chart in pictures for proper mattress sizing. The bands are not designed to make your sheets wrinkle free or totally immobile. See the video in "related videos on this page" for product details. It's primarily designed for a hassle-free way to keep your bottom sheet corners in place and to keep your other bedding from having to be tucked under the mattress at the foot of the bed, never lift your mattress again. NO MORE NUISANCE SHEETS - Tired of waking up every morning with your bedding all over the place? Introducing a brand new concept in mattress bands from Rubber Hugger - your one stop solution to keep sheets secure on the bed instead of untucked, bunched up, or on the floor. ONE OF A KIND PRODUCT - Unlike comparable products on the market, this uniquely designed band fits around the entire circumference of the mattress, securing the bottom and top sheet in place and are conveniently hidden by your comforter. You will never have to tuck anything under your mattress ever again. NO FUSSY CLIPS OR GRIPPERS - This bed sheet band takes just 60 seconds to install with no time consuming clips, grippers, pins, clamps, buckles, plastic pieces or tubing that need to be fitted every single time you change your sheets. After this band is installed you never have to remove it, even when you change out your bedding. NO MORE LIFTING HEAVY MATTRESSES - Never worry about heaving up your mattress to tuck in sheets ever again. These are the BEST and ONLY bed sheet bands on the market due to their versatility, flexibility and the ability to withstand tension and multiple uses.